Recently, I have found myself becoming more and more interested in the actual term ‘outsider’ art, and what it really means. 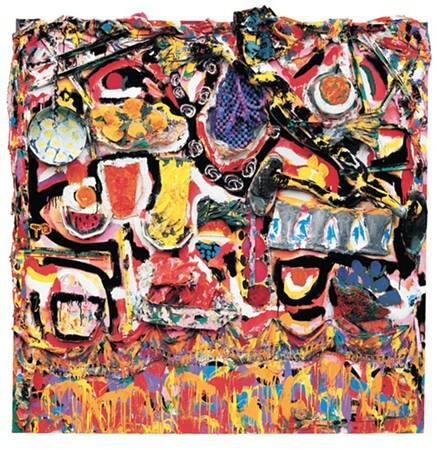 Originally coined by Roger Cardinal as an English equivalent to Jean Dubuffet’s Art Brut (or ‘raw’ art), the term has grown to encapsulate a huge variety of works. There are many offshoots of the term, and it has become a sprawling label that many find difficult to define (including myself! )During the ‘golden age’ of ‘outsider’ art; which occurred between 1880 and 1930, the term was predominantly retrospective in that it defined the works of those who were now dead. It mainly included those who were incarcerated in some form or another, or those who suffered from severe social exclusion and the inability to access the commercial art market. Today, the term is more of an ‘umbrella’ for a variety of styles, works and artists. Under this umbrella we might see ‘Contemporary Folk Art’, ‘Marginal Art’, ‘Naïve Art’, ‘Self-Taught Art’ or ‘Visionary Art’. In this post, I hope to try and define some of these offshoots; if they are in fact definable in a black and white sense. My understanding of the term ‘outsider’ art itself keeps changing; every time I read more about it – so I am sorry if this post seems confusing or the terms seem to overlap – I am trying to work out where I stand with regards to what the ‘label’ means to me. Self-Taught Art is probably one of the more common offshoots of ‘outsider’ art that we see used. The term itself is quite self-explanatory; it describes those artists who have not received any formal professional art training. This would insinuate an exclusion (by choice or not) from the commercial or professional art market. But, to some extent, aren’t all artists self-taught? They all have their own unique style and choice of subject matter, despite where or how they receive their formal art training. To describe self-taught artists as ‘outside of the art historical canon’ seems somewhat of a generalisation. Just because an artist has not received professional art training does not mean to any extent that they are not aware of current art trends or the flow of art history. Folk Art, I think, is a little easier to define. It describes a more traditional, indigenous style that is characteristic of a particular culture. I think I have said it myself already here – it is a style. Self-Taught Art and ‘outsider’ art (however we choose to define it) do not describe a specific style. Some may disagree with me, but I think that ‘outsider’ art far from describes a style. It is not akin to, say, Expressionism or Impressionism or Pop Art. It has become more about labelling the artist, rather than the work itself. Back to Folk Art – Folk Art is in fact the perfect example of how these offshoots of ‘outsider’ art overlap and intermingle. Folk Art itself is often characterised by a unique naïve style (Naïve Art will be discussed later) – perhaps I am getting confused here – if Naïve Art is the style, does that mean that Folk Art is not a distinct style? Thornton Dial – Folk Artist? Marginal Art describes the work of artists who are on the ‘margins’ of society for numerous reasons. But wait… Isn’t this one of the definitions of ‘outsider’ art? Some describe Marginal Art as that ‘grey’ area which sits right between ‘outsider’ art and the art of the mainstream commercial art world. So, for example, the scale would be as such: Mainstream Art – – – – Marginal Art – – – – Outsider Art? Naïve Art – I think – can be said to be a style. It is often produced by untrained artists (there’s the overlapping again), who depict realistic scenes combined with fantasy scenes in often bright, bold colours. Often defined by childlike simplicity with regards to the composition, subject matter or colour, present day Naïve Art is often created by those who have received formal art training – in fact, there are now even academies for Naïve Art. Does this mean it is no longer an offshoot of ‘outsider’ art? 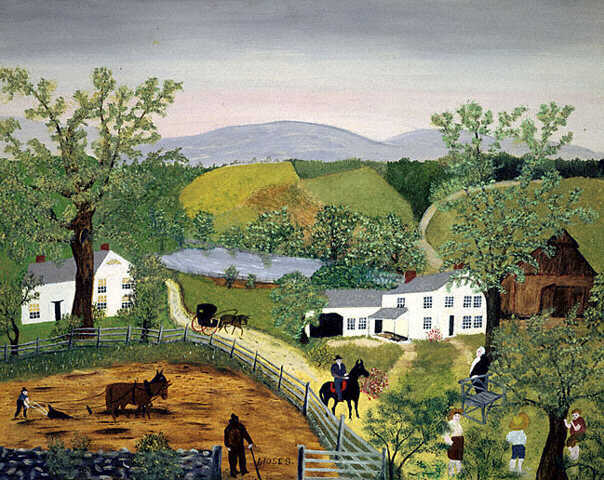 Grandma Moses – Naive Artist? Visionary Art is another umbrella term – a term which can avoid the specifics and the confusion created by the label of ‘outsider’ art. It encompasses all of the above; Naïve Art, Folk Art etc. Visionary Environments, however, are slightly different (please refer to my previous blog post for more on Visionary Environments). These environments are created by intuitive artists and describe spaces that have been re-created in an extremely creative manner; often they are ‘fantasy worlds’ into which we can escape. It seems, however, almost ignorant to group these Visionary Environments under the umbrella of ‘outsider’ art – as often, the artists who create this amazing spaces are very much an integral part of their local community; they are by no means on the margins. I hope I have got you thinking about what the term ‘outsider’ art means to you – it is confusing, I know! The more I think about it, the more questions it raises for me. I am not sure it is really an appropriate label in terms of where the art of marginalised people stands today in the twenty-first century. Today, many an art work is undefinable – it doesn’t fit specifically into the art historical canon, but just putting artists into the ‘outsider’ art category seems to reduce the impact of the label itself. What I enjoy about ‘outsider’ art is the rawness of it; and the diversity – something which seems to be almost characteristic of such a broad title! Let me know what you think about ‘outsider’ art..